Sevilla are reportedly weighing up an approach to sign defender Eric Bailly from Manchester United during the ongoing transfer window. The Ivory Coast international joined the Red Devils from Villareal in the summer of 2016 but he has since struggled to cement a regular starting role due to fitness, disciplinary and form concerns. 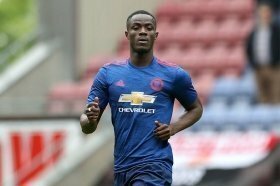 According to The Sun, Bailly's future with United remains uncertain on the long-term with the club expected to sign at least two centre-backs before the start of next season. Amidst this, Sevilla are said to be keen on luring him back to the Spanish La Liga and they are prepared to make an offer for his services as early as this month. Bailly currently has 18 months remaining on his existing deal with the Red Devils and so far, the club have shown no indication of prolonging his stay further than the stipulated length. The Ivorian is currently serving a three-man suspension with United after being handed a straight red card during the triumph over Bournemouth last weekend.